protein S18 is especially unstable and can hardly be isolated in a globular (non-denatured) state. When these proteins form a complex, however, they stabilize each other. Protein-protein complexes may play an important part in the structure and function of the ribosome, participating in the formation of protein quaternary structures on the ribosomal surface. Generally, ribos-omal proteins are not dispersed over the compactly folded ribosomal RNA but rather clustered. For example, four clusters of ribosomal proteins can be mapped on the bacterial small (30S) subunit: S4-S5-S12-S16-S20 at the central part ("body"), S8-S15-S6-S18-S21-S11 on the side bulge, and S7-S9-S13-S19 and S3-S10-S14 on the head. Such clusters may be protein complexes with quaternary structure. At the same time, proteins of different clusters may intract with each other; for example, proteins S5 and S8 have complementary hydrophobic areas on their surfaces that may be responsible for their contact within the ribos-omal particle. The quaternary structures of ribosomal domains and subdomains are formed with the participation of both ribosomal RNA and ribosomal proteins. Ribosomal proteins are arranged on rRNA and, at the same time, may contribute to the compact folding of rRNA in the ribosome. They are thought to stabilize RNA-RNA tertiary contacts in rRNAs and sometimes induce local alterations in rRNA secondary and tertiary structure. The major role in stabilization and induction of alterations in rRNA structure is attributed to the so-called primary, or core rRNA binding proteins. By definition, these proteins interact with rRNAs directly and independently of other ribosomal proteins. Most of other ribosomal proteins (if not all of them) also interacts with rRNAs but their binding to rRNA depends on the presence of the primary binding proteins. Thus, in the course of ribosome assembly (see the next Section 7.6) these proteins stabilize and reorganize local rRNA structures in such a way that new protein binding sites become available (at the same time, the role of protein-protein interactions in this process should not be neglected). The low-molecular-mass 5S ribosomal RNA may interact with several proteins in the large subunit (Horne & Erdmann, 1972), forming a complex located in the region of the central protuberance (see Chapters 5 and 8). In E. coli ribosomes three proteins - L5, L18, and L25 - form a rather stable nucleoprotein complex with the 5S RNA. In Thermus thermophilus ribosomes, however, protein L25 is replaced by another protein, TtL5, which is twice larger than EcL25 and has just a low sequence homology with EcL25. In Eukaryotes only one protein (RL5 or YL3) is shown to form a stable complex with 5S RNA; it seems that the N-terminal part of the protein is homologous to EcL18, and the C-terminal part may be equivalent to EcL5. In any case, the 5S RNA-protein complex looks less conservative that other elements of the ribosome structure. Of particular interest, of course, are the interactions between the ribosomal proteins and the high-molecular-mass ribosomal RNA (16S and 23S prokaryotic RNAs or 18S and 28S eukaryotic RNAs), since these RNA species serve as the main covalent backbone and the structural core of the ribosomal subunits. As mentioned above, the primary (core) rRNA-binding proteins interact with the corresponding RNA sites on the high-molecular-mass rRNAs, more or less independently of other proteins. In the case of the E. coli 30S ribosomal subunit, proteins S4, S7, S8, S15, S17, and S20 are the core proteins that can independently interact with the 16S RNA (Mizushima & Nomura, 1970). Each of these proteins binds only to a specific site on the 16S RNA, recognizing the corresponding nucleotide sequence and three-dimensional structure. The location of the binding sites of the six above-mentioned proteins along the 16S chain is shown schematically in Fig. 7.6 A. It is seen that proteins S4, S17 and S20 are complexed in the region of the 5'-termi-nal third of the 16S RNA (domain I), proteins S8 and S15 interact with the middle part of the 16S RNA (domain II), while protein S7 has its binding site located in the region of the 3'-terminal third of this RNA (domain III). As for the E. coli 50S ribosomal subunit, proteins L1, L2, L3, L6, L9, L11, L23 and L24 bind directly and specifically to the 23S rRNA (Fig. 7.6 B). The pentameric complex (L7/L12)4:L10 should be added to this list. The latter protects the whole three-way helical structure (positions 1030-1125) of domain II of the 23S rRNA (see Fig. 6.5 A), thus suggesting that namely this peripheral element of the rRNA together with the protein complex form the lateral protuberance, called L7/L12 stalk, of the 50S subunit. tion of bifunctional reagents, see Section 8.2.1) were used to define the points of contacts between rRNA and proteins (Fig. 7.6). This information helped to construct minimal rRNA fragments containing protein binding sites and to reconstitute corresponding RNP complexes that were used successfully in physical studies. As an example, the results of studies of the interaction of proteins S8 and S15 with a respective E. coli 16S rRNA fragment are considered below. As mentioned, in the 30S subunit proteins S8 and S15 interact with the central domain of the 16S rRNA. 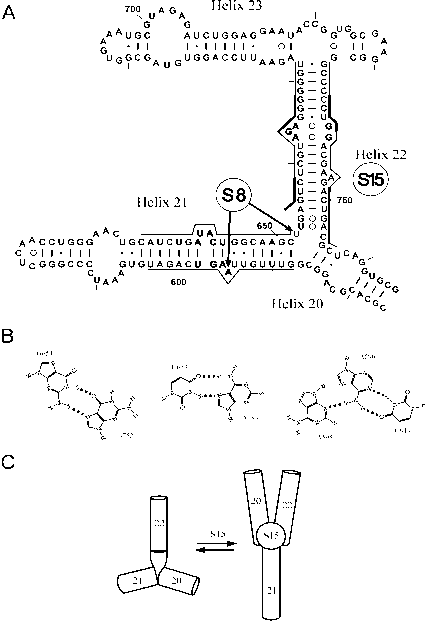 Their rRNA binding sites were located in the adjacent double-helical segments, namely helix 21 (588-604/634-651) for protein S8, and helix 22 (655-672/734-751) for protein S15 (see Figs. 6.1 and 7.7). The protein S8 binding site contains the highly conservative irregular element 595-598/640-644 flanked with double-helical regions. Protein S8 was cross-linked to A595 in the conservative element, as well as to U653 (Fig. 7.7 A). NMR spectroscopy study of the rRNA binding site for protein S8 has shown that the base triple A595:A596:U644 is present in the core element (Fig. 7.7 B). It has been also proved that U598 is base-paired with A640 in the protein S8-rRNA fragment complex, as shown in Fig 7.7 A, and the formation of this base pair is promoted by the protein. The bulged A residues (A595 and A642, see Fig. 7.7 A) seem to be directly involved in protein S8 recognition. Indeed, the deletion of A642 strongly decreases the stability of protein S8 complex with 16S rRNA. On the whole, the NMR data suggest that S8-RNA interaction is accomplished without significant changes in the RNA. At the same time, some base pairs (e.g., A596:U644 and G597:C643, as well as U598:A640) are found to be more stable in the RNA-protein complex than in the isolated rRNA fragment. Figure 7.6. Diagram showing distribution of ribosomal protein binding sites along rRNA chains. A: Diagram of the binding sites of the 30S subunit proteins on the 16S rRNA. Primary binding proteins are encircled. Cross-linking sites are indicated by filled arrowheads; centers of protection sites for proteins defined in foot-printing experiments are indicated by open arrowheads. Sites of cross-linking of the 23S rRNA to 3' terminal region of the 16S rRNA are indicated by arrows. (Based on the data summarized by F. Mueller & R. Brimacombe, J. Mol. Biol. 271: 545-565, 1997). B: Diagram of the binding sites of the 50S subunit proteins on the 23S rRNA and in the 5S rRNA-protein complex. Primary binding proteins are encircled. Protein cross-linking sites are indicated by filled arrowheads. Protein binding sites on the 5S rRNA are marked by lines. 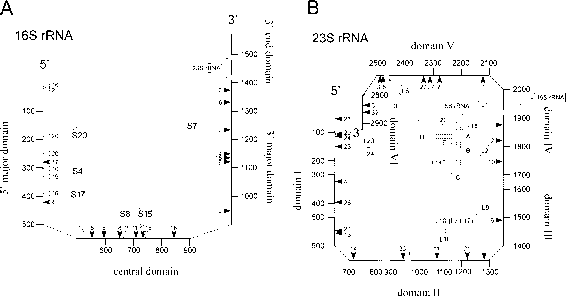 RNA-RNA cross-links (23S rRNA to 16S rRNA and 5S rRNA to 23S rRNA) are indicated by long arrows. (Based on the data summarized by R. Brimacombe, Eur. J. Biochem. 230: 365-383, 1995). Figure 7.7. Interaction of E. coli ribosomal proteins S8 and S15 with 16S rRNA. A: Secondary structure of the segment of the 16S rRNA central domain that contains the binding sites for proteins S8 and S15. The helices are numbered as in R. Brimacombe, Eur. J. Biochem. 230: 65-87, 1995. The sequences protected from chemical modification the by proteins are marked by lines. The nucleotide residues that are the most important for the RNA-protein recognition are shown in bold letters. (Based on the data summarized by T. R. Batley & J. R. Williamson, J. Mol. Biol., 261: 536-549, 1996). B: Non-Watson-Crick base pairs recognized by proteins S15 and S8 (R. T. Batley & J. R. Williamson, J. Mol. Biol. 261: 550-567, 1996; K. Kalurachchi K. Uma, R. A. Zimmermann & E. P. Nikonowicz, Proc. Natl. Acad. Sci. USA 94: 2139-2144, 1997). C: Diagram showing a possible rearrangement of the 16S rRNA segment induced by protein S15 binding. (Adapted from R. T. Batley & J. R. Williamson J.R., see the reference above). tion of two A:G base pairs). The nucleotide residues that are directly involved in the 16S rRNA-protein S15 interaction were revealed by means of site-directed mutagenesis and chemical modification interference. (In this approach, selected nucleotide residues in an RNA fragment are either replaced with other nucleotides or modified, for instance, ethylated at their phosphate groups, and then mutations and modifications that interfere with protein binding are determined). It was found that protein S15 recognizes two centers located on the same face of helix 22: the phylogenetically concerved G666:U740 base-pair, and the non-canonical G654:G752 and U653:A753 base-pairs (see Fig. 7.7 A). Structural anlysis suggests that protein S15 forms several specific contacts with hydrogen bond donor and aceptor groups of nucleotide bases situated in the minor groove of the RNA helix. Several electrostatic contacts of protein S15 with phosphate groups surrounding these base-pairs enhance the binding of the protein with the 16S rR-NA. Protein S15 causes alterations in the tertiary structure of the central domain of 16S rRNA. As seen from the scheme presented in Fig. 7.7 C, helices 22 and 20 in the RNA-protein complex adopt a nearly parallel orientation, and the overall structure of the complex became more compact than that of free RNA. The compactization of the RNA fragment structure upon protein S15 binding was covincingly demonstrated by electrophoresis in polyacrylamide gel under non-denaturing conditions: despite of higher molecular mass and lower net negative charge, the complex displayed a higher electrophoretic mobility in comparison with free RNA fragment. The mechanism of interactions of other primary rRNA binding proteins with specific rRNA sites seems to have a great deal in common with that of protein S8-16S rRNA and protein S15-16S rRNA interactions. As a rule, proteins recognize unusual elements of rRNA secondary structure (e.g. non-canonical base-pairs or bulged nucleotides) and stabilize them. Protein-RNA interactions can induce a more compact folding of rRNAs and stabilize their tertiary structure. The interactions with rRNA may also affect the ri-bosomal protein conformation: some elements of protein three-dimensional structure, e.g. flexible loops, can aquire a specific fixed conformation in the RNA-protein complexes. Other ("non-primary") ribosomal proteins interacting with ribosomal RNA require the presence of at least one, even several, core RNA-binding proteins for the formation of sufficiently firm complexes. Two patterns are possible: either an intrinsic interaction between a given protein and RNA is insufficient for the stable complex to be formed, and should therefore be supported by protein-protein interaction with the already bound protein; or, alternatively, the protein bound earlier induces (or stabilizes) the local conformation of the RNA required for binding a given protein. For example, the binding of protein S7 to the E. coli 16S RNA contributes to a tighter binding of proteins S9, S13, and S19, as well as of S10 and S14, in the 3'-proximal 16S RNA region (domain III); it may well be that proteins S9 and S13:S19 directly interact with potein S7, while the effect of S7 on the binding of S10 and S14 is less direct (see below, Fig. 7.9). Thus, both in the small and in the large ribosomal subunits, certain cooperative groups of proteins assigned to definite sites of the three-dimensional ribosomal RNA structure can be revealed. In the case of the E. coli 30S ribosomal subunit, one such group is formed by proteins of the 3'-proximal domain of 16S RNA (domain III): S7, S9, S13, S19, S10, and S14. It will be demonstrated later that they are all located on the head of the 30S subunit and may contribute to the formation of its tRNA-binding site. Another cooperative group of 30S subunit proteins is associated with the middle domain of the 16S RNA (domain II) and includes the RNA-binding proteins S8 and S15, the S6:S18 pair, as well as S11 and S21; these proteins are found mainly on the side bulge (platform) of the 30S ribosomal subunit. This group, through proteins S5 and S12, is connected with the cooperative group of the 16S RNA 5'-terminal domain (domain I); the latter group includes RNA-binding proteins S4, S17, and S20, as well as proteins S5, S12 and S16, which are constituents of the central body of the 30S ribosomal subunit. If ribosomal subunits are incubated at a high ionic strength with a sufficiently high Mg2+ concentration, the compactness of the subunits is retained, but ribosomal proteins partly dissociate from them. This dissociation is primarily the result of a weaker holding of proteins on the RNA scaffold due to their electrostatic interactions being suppressed. Both during incubation at a high salt concentration and upon a stepwise in crease in ionic strength, groups of proteins sequentially split from the particles resulting in the formation of a series of protein-deficient derivatives. This is a stepwise disassembly of ribosomal particles (Spirin et al., 1965; Itoh et al., 1968). The stepwise dissociation of proteins from the E. coli 30S subunit by increasing the LiCl or CsCl concentrations is schematically shown in Fig. 7.8. Initially, incubation with high salt results in the release of such relatively loosely bound proteins as S1, S2, S3, S14, and S21; the removal of these proteins yields 28S particles with a protein content of 30% and a buoyant density in CsCl equal to 1.67 g/cm3. Incubation in a higher salt leads to the splitting off of the next portion of proteins, S5, S9, S10, S12, S13, and S20; the resulting 25S particles contain almost half the initial proteins (20%), and their buoyant density in CsCl is equal to 1.74 g/cm3. In the range from 3 to 3.5 M LiCl, or during long-term centrifugation in 5 M CsCl proteins S6, S18, 511, S19, and then S16 and S17, are released; the residual 23S particles contain just four ribosomal RNA-binding proteins: S4, S7, S8, and S15. The removal of the latter group of proteins from RNA requires more drastic treatment, e.g. a combination of high salt and urea. The dissociation of most of the proteins from the ribosomal particles does not induce an evident disruption of the overall tertiary structure and compactness of the ribosomal RNA. Electron microscopic observations in the course of stripping E. coli 30S ribosomal subunits have demonstrated that removing half of all the proteins does not lead to significant morphological changes in the particles; they retain the same size, axial ratio (2:1), and their characteristic subdivision into a head, body, and side bulge. Moreover, morphologically similar particles can be seen after 15 of the 21 ribosomal proteins have been removed. Measuring the compactness of the ribosomal RNA in particles with different protein content using X-ray and neutron scattering confirms the electron microscopic observations; the 16S RNA retaining only 6 proteins, specifically S4, S7, S8, S15, S16, and S17, maintains the compactness and shape characteristic of RNA within the 30S ribosomal subunit (Vasiliev et al., 1986). Removal of those core RNA-binding proteins, however, affects the stability of RNA conformation more drastically: as follows from the measurement of the radius of gyration, the compactness of RNA decreases somewhat, corresponding to an increase in the linear size of about one-quarter. Nevertheless, free 16S RNA at a sufficient Mg2+ concentration and ionic strength, like the 16S RNA carrying the four proteins S4, S7, SS, and S15, is still quite compact and retains its specific overall folding pattern; it can be visualized as a characteristic Y-shaped particle the contours of which can be inscribed in those of the 30S ribosomal subunit (see Section 6.4.3). This implies that the general pattern of 16S RNA folding is governed and maintained by its internal intramolecular interactions, although the stabilization of the eventual completely folded conformation requires the set of six core RNA-binding proteins. Other ribosomal proteins may, of course, contribute to the folding and stabilization of ribosomal RNA, but they rather affect its local structures. Similar trends may be noted during the stripping of the E. coli 50S ribosomal subunit. The 23S RNA retains its initial compactness until the stage when just 9 of the 32 proteins, i.e. L2, L3, L4, L13, L17, L20, L21, L22, and L23, remain in the particles. The further removal of proteins leads to a reduction in compactness which, nevertheless, remains reasonably high, and the overall shape of the molecule does not undergo any marked changes. Thus, the step-wise stripping or disassembly of ribosomal particles clearly demonstrates that high-molecular-mass RNA plays the role of scaffold for the arrangement of ribosomal proteins. The phenomenon of unfolding (see Section 6.4.4) has shown that the RNA chain serves as a covalently continuous backbone of the particle, carrying all ribosomal proteins. The phenomenon of disassembly, during which the basic compactness and shape of RNA remain unchanged, suggests that the RNA tertiary structure forms a three-dimensional scaffold for the proper spatial arrangement of ribosomal proteins. The disassembly is reversible, implying that under proper ionic conditions the ribosomal particles can be reassembled; this includes the recovery of their functional activities (Lerman et al., 1966; Spirin & Belitsi-na, 1966; Hosokawa et al., 1966; Staehelin & Meselson, 1966). The reconstitution of bacterial ribosomal particles, both 30S and 50S, can be achieved from isolated ribosomal RNA and the complete set of individual ribosomal proteins (Traub & Nomura, 1968; Nomura & Erdmann, 1970). 40*C to 50*C). A higher ionic strength suppresses interactions between the proteins and RNA, while at a lower ionic strength the contribution of competing nonspecific interactions between basic proteins and the negatively charged polynucleotide increases markedly. The relatively high concentration of Mg2+ appears to be necessary primarily for the maintenance of the RNA tertiary and secondary structure which provides the scaffold for the arrangement of proteins. In general, the reconstitution buffer provides conditions under which ribosomal RNA is sufficiently compact in the isolated state and maintains its unique shape. Elevated temperature is believed to be necessary for facilitating the structural rearrangement of an intermediate ri-bonucleoprotein complex from a less compact to a more compact conformation.